1. If you get the crossbody bag, pls put the bag in the ventilated place 1-2 days. The smell will disappear. It will not hurt your body. 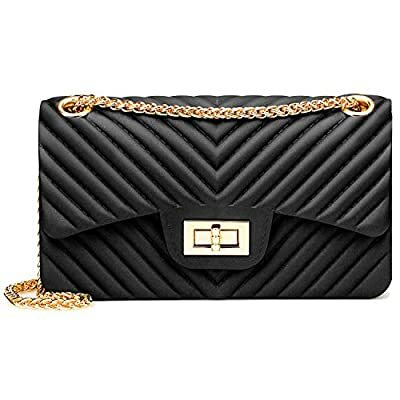 THE FASHION DESIGN : This is a full personality and very practical shoulder bag. The classic quilt design fuse the Summer style. Let the bag unique and trend. ENVIRONMENTAL MATERIALS : The crossbody bag use green silicon as material. It is not recycled material. Though the bag has some little smell, but it will not hurt your body. HIGH QUALITY HARDWARE : The quilt shoulder bag selects high quality hardware. The gloss is very good and it will not be easy to fade and rust. Double chains design, you can easy to adjust the length. GOOD CAPACITY: This fashion cross body bag has size dimensions as 6.69"L x 3.55"W x 3.54"H / Weighs approx:1.41 LBS. The handbag can take your private goods liking cosmetics , credit card , wallet and cell phone. There is an interlayer. You can easily separate your goods. PERFORMANCE: This crossbody is very easy to clear and storage. Not like leather handbag, It can be press and meet the water. This shoulder bag will not easy to be out of shape. You can use for long time.